While I wait patiently ***rolling eyes*** for Amy to finish writing Iniquity, the last book in her fabulous Premonition series, I get spend some time with one of my favorite book boyfriends from 2013, Trey Allairis. 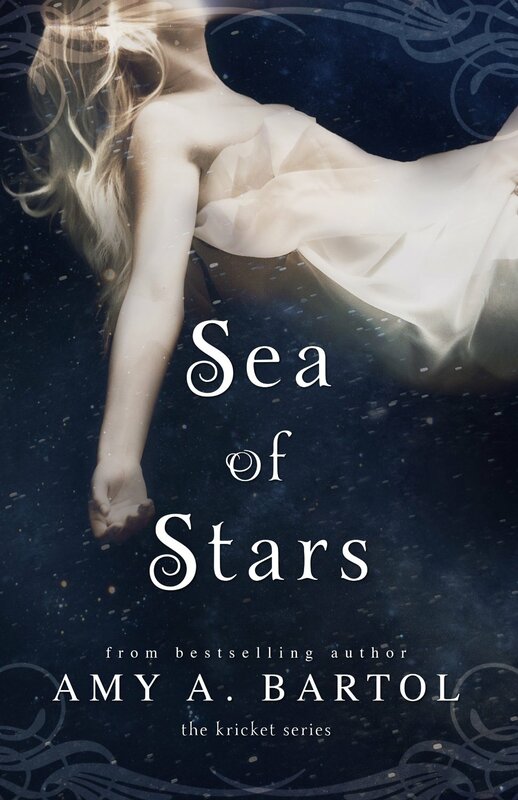 I have yet to be disappointed with anything that Amy writes, Sea of Stars is no exception. This book wastes no time at all. We are thrown right into the action with Kricket and Trey. With the prologue doing an excellent job of explaining where things are in the storyline, we find Kricket with Trey preparing to leave the war ship. Like the summary suggests, Kricket is wanted by everyone and all of the houses in Ethar because of who her parents are and the powers that she has. At every turn and with every premonition, Kricket has to make quick and sometimes dangerous decisions. I have so much admiration for our heroine, because she has a strength that comes from a dark past. She was abandoned by her parents on Earth and put into the foster system in Chicago. We get glimpses of her sad past, but she uses her “street smarts” to her advantage. In the first 10% of the book, she outsmarts more than one enemy. We are introduced to a new character, Giffin, that makes quite an impression on Kricket, because he has a gift that she has not seen before, but somehow makes them kindred spirits. “Then you’re going to have to find out, aren’t you? Open your chakras, meditate—get in touch with your spirit animal,” he says condescendingly. ‘whatever it is you need to do to find out— do it!” He lifts my arms again and I grind my teeth. I breathe the words, “I wish I knew—“ As I exhale, my breath curls into the air in a cold, smoky plume from the chill in my lungs. My eyes roll up to the ceiling. The poseur soldier’s hand slides from my neck to my ribs, holding me against him so that I don’t slip to the floor….. I hope that he see my spirit finger as I flip him off. Kyon Ensin, her intended husband, from Alameeda is the one character that I’m not impressed with. Mainly because he reminds me too much of Amy’s character Brennus in the Premonition series. He didn’t ring all that original to me, and I found him to be a bully more than anything else. Now for my favorite part…Trey Allairis. *happy, swoony sigh* Man, he is so perfectly amazingly wonderful in this book. This series is definitely New Adult, not Young Adult. I loved the intimate scenes between Trey and Kricket. It was a beautiful balance with the intense action and violence throughout the story. Amy’s writing style is so visual that I could totally see this being turned into a movie or tv series. Things happen to Kricket that she choices not to remember, because they are too dark. It made my stomach knot with worry. That’s why the scenes with Trey are so important. My desire for him is insane. He’s not sentimental—neither of us is—and yet he says things to me that strike at the core of my being and speak to the fighter in me. He makes me crave him in the most vulnerable way. I can’t lose him—ever. By the end, I found it difficult to not become more attached to the main characters, because of what they go through, not just to be together, but to save everyone that is important to them. The ending is OMG how could you do this to us Amy? good. Hopefully we won’t have to wait too long for the third book, Darken the Stars, for our relief. I give this book 5 crazy sparkling stars, and put it on my “books that own me” and “top shelf fantastic reads” shelves on Goodreads. The book will be available on March 31st. You can preorder the book at Amazon. If you haven’t read the first book, Under Different Stars, check out my review here. This entry was posted in Adult Romance, Best of 2013, Book Release, Books, Favorite Authors, Favorite Book Boyfriends, New Adult, Paranormal Romance and tagged Amy A. Bartol, Kricket Hollowell, Trey Allairis. Great review, and I agree with you absolutely. Trey is totally polar! Can’t wait for the next book. Thank you! Have you read Amy’s other series? Sadly, no, but they have been on my TBR list for years! Have moved them right up to the top so I plan to really soon.